Heath Hodges and his big 20-point Leflore County buck. Heath Hodges won something akin to a big buck lottery on the afternoon of Dec. 3 when a huge 20-point brute chose his trail to walk down. One shot from the Itta Bena hunter’s .35 Whelen, and the big buck was on the ground. One of those five after the buck, a bowhunter, had the big deer at 35 yards last season but held off because he couldn’t get the shot he wanted. Others have seen trail cam photos of the buck and, like Hodges, the big non-typical deer eluded all of them. 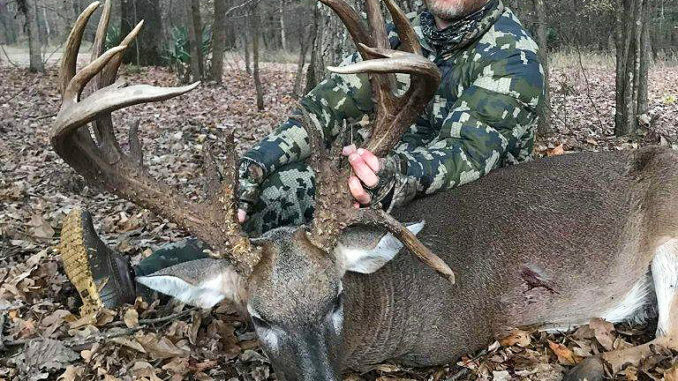 It’s not like it was all pure luck on Hodges’ part: He and a hunting buddy had been watching for this deer, and had it patterned for the past four weeks. He had actually seen the deer three times this fall, but never had the right situation for a shot on the buck. The area around Itta Bena in Leflore County is farmland in the central part of the state, and Hodges family owns about 1,000 acres of cotton, soybeans and corn on the family farm. On this day, he was actually hunting an adjoining 80-acre plot a friend allows him to hunt. “I got on my stand around 2:30 that afternoon and after getting settled in, I picked up my grunt call and rattling horns and periodically called and rattled. Before long, two does came by me, walked past and actually bedded down 25 yards from me. They stayed there about 30 minutes,” he said. Hodges continued to hit his grunt call and rattling horns, and when he looked down the trail he had been watching, the big buck was heading straight to him. “I guess he was responding to my rattling and grunting because he was headed right to where he’d heard it, which put him right in front of me at 25 yards. I eased my gun up, squeezed the trigger and he ran about 20 yards before piling up,” Hodges said. “I decided to shoot my .35 Whelen because I knew if I had a shot it would be fairly close, and that gun can do the trick on a buck that close,” he added. As soon as he shot and watched the buck fall, he sent a text to his buddy hunting on another site to give him the news. The buck was a sight to behold, with 20 scoreable points and a long drop tine. The inside spread was 19 3/8 inches,with 26- and 27-inch main beams and heavy mass throughout the rack. The giant green-scored a whopping 217 5/8 inches of antler bone. Estimated to be 5 ½ to 6 ½ years old, the big old buck tipped the scales between 250 and 260 pounds.